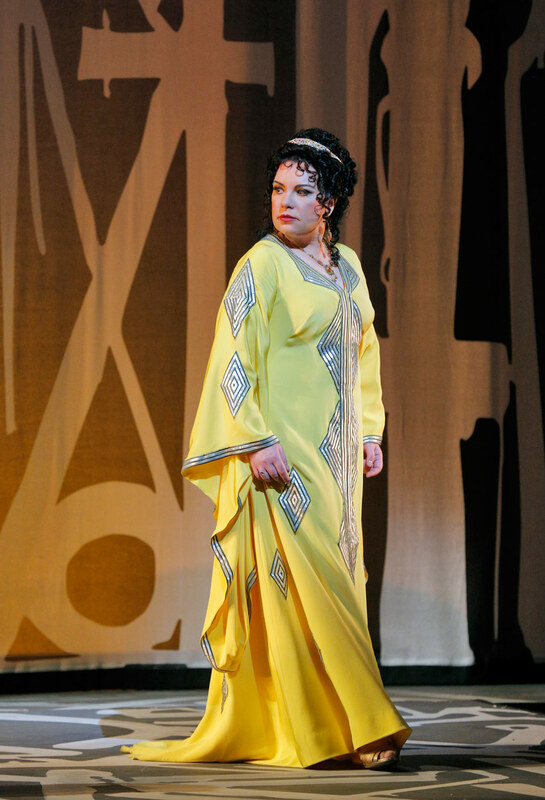 Ekaterina Semenchuk as Amneris in San Francisco Opera's production of Aida. Photo by Cory Weaver. 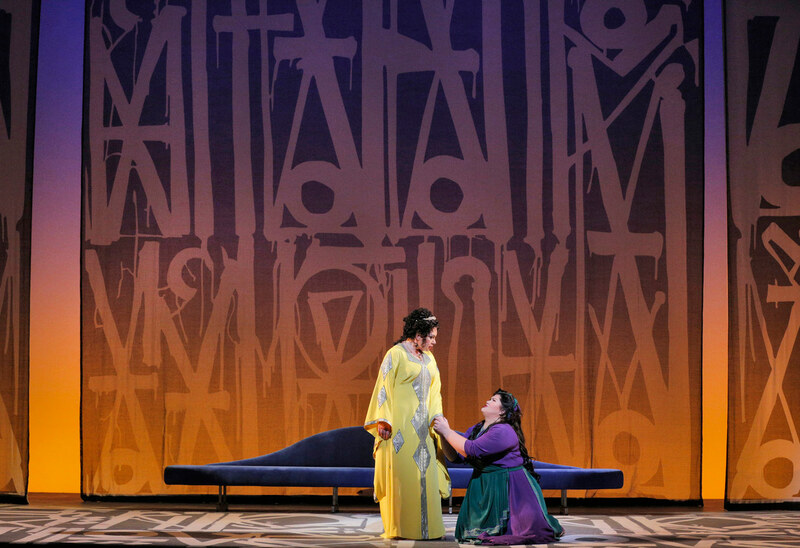 Francesca Zambello’s new production of Verdi’s Aida, with set designs by visual artist RETNA, is currently onstage at San Francisco Opera until December 6; opposite Brian Jagde as Radamès and Leah Crocetto as Aida, Russian soprano Ekaterina Semenchuk reprises one of her signature roles as Amneris. What kind of a woman is Amneris? What do you think are some misconceptions about her character? Amneris is a young woman in love. She is the daughter of the Pharaoh and loves Radamès, but she can’t tell him because she suspects he has affection for another woman. Through her own cunning she finds out that his beloved is Aida, but she does not give the order for her to be destroyed, which any other woman of her position could easily do in those times. But we should not forget that this opera was composed by the greatest humanist: Verdi! Here at San Francisco Opera, after the premiere, when I was coming downstairs, several boys from our performance shouted to me sincerely: thank you for trying to rescue Radamès! It is so pleasant that children do not realize the motives behind the actions of the Pharaoh’s daughter, but simply value her aspiration to save another person and see her kindness. She fights in the last act not for the love of Radamès, but for his life. What does a role like Amneris demand of the voice? How did you discover that this repertoire fit well for you? I have loved Aida since childhood. I listened to a very old recording where Oralia Domínguez sang the role of Amneris and Maria Callas the role of Aida. It is a very special recording for me. I was also influenced by Ebe Stignani, who became a mentor to me. But, regarding the recording with Oralia Dominguez, I liked Amneris more than Aida. Having already determined my voice type, I began to dream of singing this role. The first time I sang Amneris was in June 2011 at the Mariinsky Theatre under Maestro Valery Gergiev in the premiere production by Daniele Finzi Pasca for the Stars of White Nights Festival. It was Daniele who revealed to me the fragility and importance of Amneris’s mission, both as a human being and spirit and messenger of peace. Amneris is one of the most difficult roles in the mezzo-soprano repertory. It requires intense concentration and incredible physical and moral commitment, not only in the last act as many people believe. At the very beginning of the opera, a careful, disturbing and somewhat ominous leitmotif of jealousy sounds. Amneris appears with it, lives with it throughout the opera, and by the last act the motive has become a storm. But this storm is in her from the start, she simply keeps her emotions down in the beginning. On the whole Amneris must be reserved, because she is the Pharaoh’s daughter and her nobility requires it. She carries out a dialogue with Aida, speaks tenderly talks to Radamès, but inside her all is boiling. It is difficult but very important to show this appearance of serenity while her turbulent feelings are boiling inside. In the opera, Verdi’s leitmotifs reveal all of this. Ekaterina Semenchuk as Amneris and Leah Crocetto in the title role of Aida, San Francisco Opera, 2016. Photo by Cory Weaver. Are there any roles you’ve performed with which you have felt a particular connection or admiration? Why? I do not sing roles that I dislike. All of them are favorites and I admire them. The roles that I sing are women who love, and for most of them it is a tragic love which causes a storm of emotions: Charlotte in Werther, Carmen, Dalila, Dido in Les Troyens, Azucena in Il Trovatore, Amneris, Eboli in Don Carlo, Giovanna Seymour in Anna Bolena and Lady Macbeth. Each is very special and touches in its own way. I understand my heroines, and therefore I always justify them. They are unfortunate women, not villains! Amneris loves Radamès and is even ready to forget her principles for him. She is literally on her knees at the end of the opera, begging the priests to spare Radamès; the queen becomes an ordinary woman. I think she deserves to be loved just for being so sincere and real. Azucena’s is the saddest story in opera, and it was the most difficult portrayal for me. Lady Macbeth: one of my favorites! The role is a masterpiece in spite of her villainy. She is a strong and emotional character who can be sympathetic because none of us wants to be in her shoes; her choice is precisely the direction one should not go. What do you do for fun/relaxation when you’re not in rehearsal or onstage? Frankly speaking, there is rarely enough time left outside of rehearsals and performances. I communicate with my family, I like reading, visiting nature, and riding horses! In my city, St. Petersburg, I am a member of the friends of the Hermitage Museum club and am invited to the rare and interesting exhibitions. I have several favorite halls in the Museum and one of them, Treasure Gallery (which you must book at least a month in advance!) I have visited approximately ten times. Here in San Francisco you have many fantastic museums like the Museum of Modern Art and Asian Art Museum and, of course, all of the exhibitions and museums dedicated to marine history. Each time I visit, I find something new! I don’t always have time for all that I want to see in other countries and cities, but I try. I like to walk very much. For example, here in San Francisco, I walk by the ocean for hours, just to walk and meditate. Ekaterina Semenchuk as Amneris, in Act II of Aida, San Francisco Opera, 2016. Photo by Cory Weaver. Because it is my vocation. Each God-given talent must be developed. I sing to bring good to people. The voice is like a medicine: it can force the person to think of something in a different way. It can rescue, can direct, call for life and can communicate much more. The human voice is flexible and all-powerful. If you didn’t sing for a living, what else would you do instead? I would be a doctor and be more engaged in horse-riding.